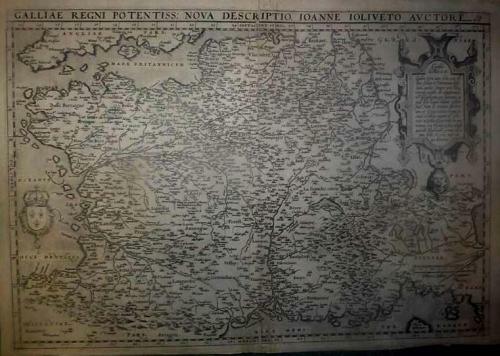 SOLD Galliae Regni Potentiss: Nova Descriptio Joanne Ioliveto Auctore. Striking and beautifully copper engraved map of France, with parts of Switzerland and Italy, from the 1574 Latin edition of Ortelius' Theatrum Orbis Terrarum, the first modern atlas of the world. Strong dark impression with wide margins. Large Cartouche, coat of arms and scale of miles. Latin text to the verso. A dark impression on strong paper. Uncolored as issued. Good margins margins. Paper washed and some small repairs.